On Saturday May 19th, lodge members Pam and Steve Poff celebrated the marriage of their daughter Courtney and Dustin Baldwin in our grand event hall. The families spent several days in the event hall making it look extra special. Check out the video to see what they did! We thank the families for hosting their event in our lodge and we wish Courtney and Dustin all the best for the future. Interested in reserving the grand event hall for your next event? Contact us and let us know what you’re looking for. 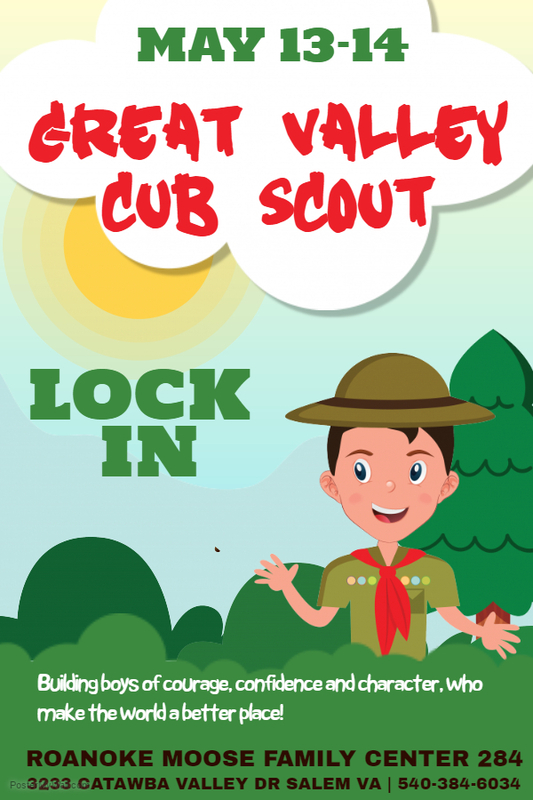 Roanoke Moose Family Center 284 is proud to host the Great Valley Spring Cub Scout LOCK-IN in the big hall this Saturday and Sunday. Due to the weather the Great Valley Spring Cub Scout Campout would be a little soggy, so they are bringing the fun indoors and doing an overnight LOCK-IN. We look forward to having the hall be full of joyful noise and activity. Welcome!